This extremely rare silver bracelet is made by skilled silversmiths close to Santiago de Compostela in northwest Spain. Do you want to support your friends or loved-ones as they travel through life and face its challenges, or give them something special to enhance their goals or celebrate their achievements? Let us send this unique and enchanting Peregrino bracelet on your behalf to show how much you care. The 1,000-year-old pilgrimage to the shrine of St. James in the Cathedral of Santiago de Compostela is known as the Way of St. James (El Camino de Santiago - in Spanish). "El Camino" criss-crosses Western Europe, arriving at Santiago de Compostela in Northern Spain on the Atlantic coast. 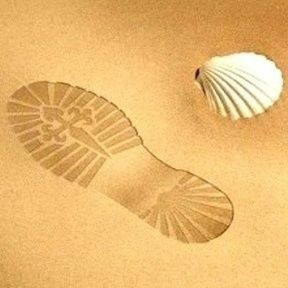 At least 200,000 people travel the Camino each year from all over the world: Some people walk, others travel by bike. Many travellers choose to do the Camino for personal, rather than any spiritual or religious reasons - taking time out from their busy/modern lives and perhaps finding inspiration along the way, whilst reflecting on their life in a supportive environment. Many carry with them a Scallop Shell like on this bracelet. Everyone experiences the journey in a different way. Description: The sterling silver charm bracelet features a bold and beautiful symbolic scallop shell at the end. It measures approx 16.5cms (7.25") in length with a 2.2cm extender and can be worn on its own or with added charms. Do you know someone who could do with some exta encouragement and faith as they embark on new ventures, or set out on a journey? 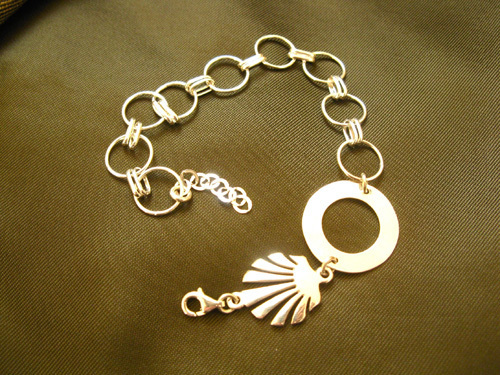 Show them that you care with this unique Peregrino charm bracelet. Comes gift-wrapped, like all our presents - and we can print a personal message on your behalf.